On a bed or pile of clothes. Despite its resting through the day. Just to hang around with me. 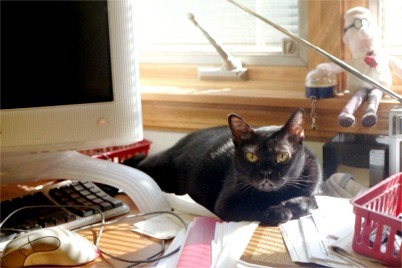 I was inspired by the habit of my cats to rest in unlikely places, particularly in front of my computer monitor, in spite of whatever notebook, pen, checkbook, or other objects may already be occupying my desktop. I wrote the first line, which encouraged me to try finishing the poem. As I was writing the poem, I was uncertain just what tone I was striving for. It did not really become a humorous poem—I hope it is a humorous poem—until I got to the end. Several additional verses remain unfinished, which is likely all for the best. (My attempt to rhyme “belied” and “reified” was likely never a good idea.) I wrote the poem 5/26/2008. Below is a picture of Eve on the other desk in my office. (Neither of the desks in my office could be called neat.) She is awake here, showing off her beautiful eyes, but she had been sleeping before this picture was taken.